The ‘right-to-work’ zones can’t apply to just part of the state, they claim, but a LePage adviser is confident it would survive a court challenge. AUGUSTA — A controversial component of Gov. 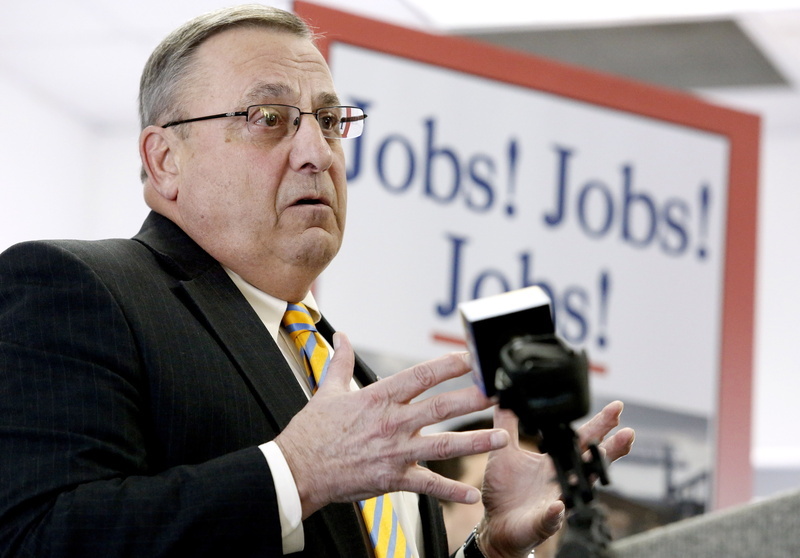 Paul LePage’s plan to attract manufacturers to Maine would violate federal law, labor unions told lawmakers Monday. Administration officials, however, said they are confident that the proposal would survive a legal challenge. At issue is a bill submitted by LePage that would provide generous tax incentives to companies that invest more than $50 million and create 1,500 jobs if they locate in one the state’s two closed military bases: Brunswick Naval Air Station or Loring Air Force Base. At a public hearing before the Legislature’s Labor, Research and Economic Development Committee, members of the public and lawmakers focused primarily on a section of the bill that would exempt companies located in so-called “right-to-work zones” from collective bargaining requirements. In these zones, workers represented by a union would not be required to pay dues. In states that have right-to-work-laws, unions find it difficult to operate and organize. While federal courts have allowed states to enact right-to-work laws statewide, the courts have never allowed such laws to be enacted only in portions of a state, said labor attorney Jeffrey Neil Young and Matt Schlobohm, executive director of the Maine AFL-CIO. “This is clearly illegal,” Schlobohm said. Young said federal courts in New Mexico and Kentucky have rejected municipal ordinances that set up right-to-work zones. LePage’s senior economic policy adviser, John Butera, said the legal staff at the Legislature’s Revisor of Statutes Office examined the issue and determined that states do have the authority to create right-to-work zones. No other state has created such a zone, but the Delaware Legislature recently considered a similar bill, he said. Butera, who worked previously as a consultant helping corporations select sites for new factories, said company CEOs and presidents have told him numerous times that they would not consider expanding into a state that did not have a right-to-work law. The lack of such a law is often a “deal-breaker,” he told the committee. Given that the bill would limit the right-to-work provision to just two areas and would go into effect only if large companies relocated there, opponents don’t have much to worry about, he said. The bill has no chance of passing with the right-to-work provision in it because Democrats strongly oppose such a measure, said Sen. John Patrick, D-Rumford, who co-chairs the committee. However, he said, there is support for some of the bill’s other provisions. They include allowing qualifying companies to keep 100 percent of their corporate income tax for the first 10 years that the project is in operation; a sales tax exemption; annual reimbursement for up to five years from the Efficiency Maine Trust for electric rates that exceed the national average industrial rate; and access to a pool of up to $400 million in long-term, credit-enhanced financing at taxable bond rates for a single project. Rep. Amy Volk, R-Scarborough, the ranking Republican House member on the committee, said after the hearing that she would like to see the bill move forward even if it means compromising with Democrats and removing the right-to-work provision. “I would like us to work something out,” she said. While LePage is unlikely to support a compromise bill, Volk said, she hopes he would not oppose it. Correction: This story was updated at 12:48 p.m. on Tuesday, March 25 to correct the name of labor attorney Jeffrey Neil Young.